A court in Kazakhstan has sentenced a man to four years in jail after he posted messages on Facebook that prosecutors argued were demeaning to the country’s president. The November 30 sentence followed the Almaty’s court ruling to find Aset Abishev guilty of belonging to a proscribed political organization and funding a criminal group — both designations used by the government to describe the Democratic Choice of Kazakhstan, or DVK. The prosecutor argued that while Abishev had not provided actual funds to DVK, he had in effect provided “information support” by means of his online postings. 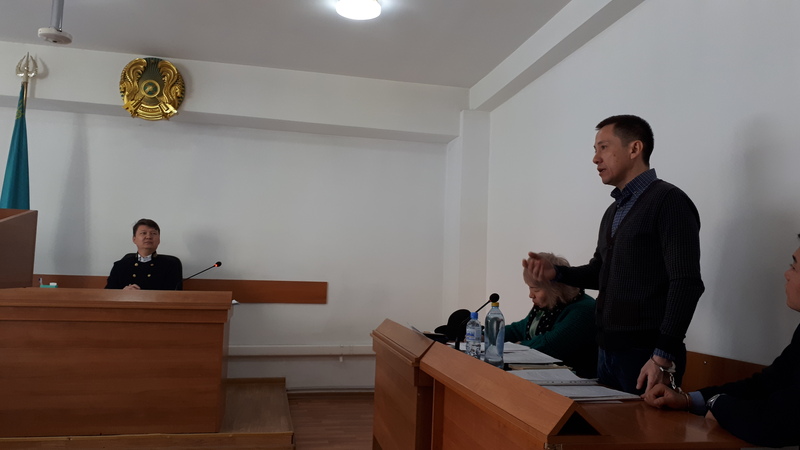 The prosecutor made little secret of the explicitly political nature of the case and said as much during November 14 hearings attended by a Eurasianet reporter. If Kazakhstan had not already largely silenced the government’s most vocal critics through arrests and harassment, this latest ruling could have stood to send chills through the beleaguered opposition. Abishev’s case unfolded in parallel with other trials sparked by Astana’s abiding contempt for DVK and, most especially, its exiled founder, Mukhtar Ablyazov. The one-time insider-turned banker-turned Nazarbayev nemesis was himself sentenced to life in jail in absentia on November 28 on charges of ordering a contract killing. Ablyazov denies the accusations, calling them politically motivated. Efforts by the authorities to formally criminalize DVK, which they accuse of being little more than a plot to usurp power by violent and illegitimate means, peaked in March when a court in Astana ruled to label the movement as “extremist.” Anybody expressing online sentiments in favor of DVK after that left themselves open to grave criminal charges as a result. During her peroration to the court in mid-November, prosecutor Altynai Buranbayeva argued that Abishev had through his Facebook posts about DVK “discredited the head of state, members of his family and the ruling power of the Republic of Kazakhstan.” He had also “incited a mood of protest among the population” through his postings, she said. Abishev described the charges as “absurd.” He told the court that he did not believe it was a crime to express opinions critical of the government. The defense team appeared to have been handed a slender lifeline when a key prosecution witness recanted her testimony. On November 14, Roza Abylkasova told the court that she had been under “psychological pressure” from investigators who she said took her to a police precinct for an interrogation. Abylkasova claimed that the strong medication she was prescribed following a recent operation had left her unable to think clearly. As a result of intimidation, she signed a statement without reading it in full out of a desire to return home, where her elderly mother was waiting alone, Abylkasova said. Abishev’s lawyer Gulnara Zhuaspayeva complained of multiple violations of due process during the trial. She declined to attend sentencing in a sign of protest. Warsaw-based Open Dialogue Foundation recently identified Abishev among some 30 people in Kazakhstan that it said had been targeted with legal procedures between March and October 2018 in reprisal for critical postings on social media or in messaging apps. In a report published last month, Open Dialogue Foundation described cases in which those who confess and repent typically receive more lenient treatment, such as non-custodial sentences. For Abishev supporters following the case in court, the implications are clear. “If they lock up everyone for posting something critical, soon there won’t be any room left in the cells,” one person in the court gallery at a hearing last month was heard to mutter. Joanna Lillis is a journalist based in Almaty and author of Dark Shadows: Inside the Secret World of Kazakhstan, which was released in hardback in October.